The RIVER solar generator is the most recent product to perfect both solar and battery technology. This simple, but refined generator stores 412Wh of power and can charge 11 devices at once. 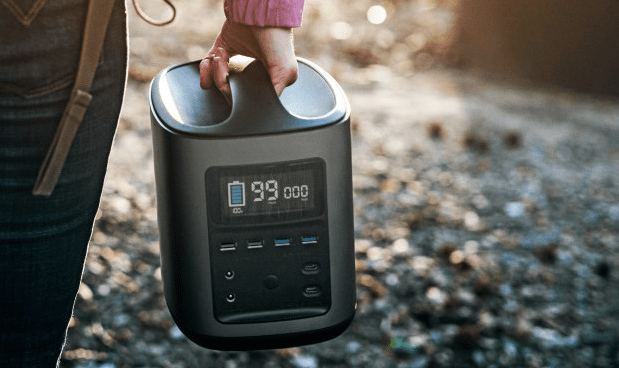 It’s weighs only 11 pounds and can still power a small refrigerator for 10 hours or longer. The greatest thing about the RIVER is its price point. Its early bird option is cheaper than most other solar battery banks while offering more charging capabilities. For this reason the RIVER’s Indiegogo page has blown up. They have surpassed their initial 30k goal and have raised over 700k! EcoFlow Tech, the company that created RIVER, did a great job at giving the device a quality design. The battery itself is very portable while still packing a punch. It weighs only 11 pounds and has capacity of 116,000 mAh. Making it one of the lightest ultra-capacity batteries on the market. 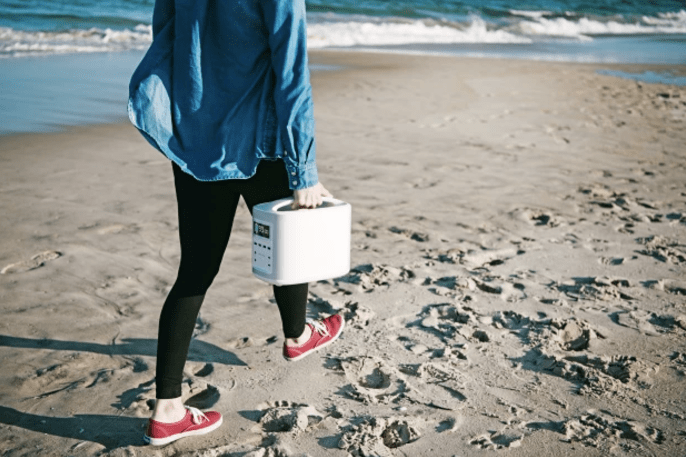 To make it even more portable the team at EcoFlow designed the battery with a large carry handle. This stationary handle is conveniently located on top of the device for effortless transportation. 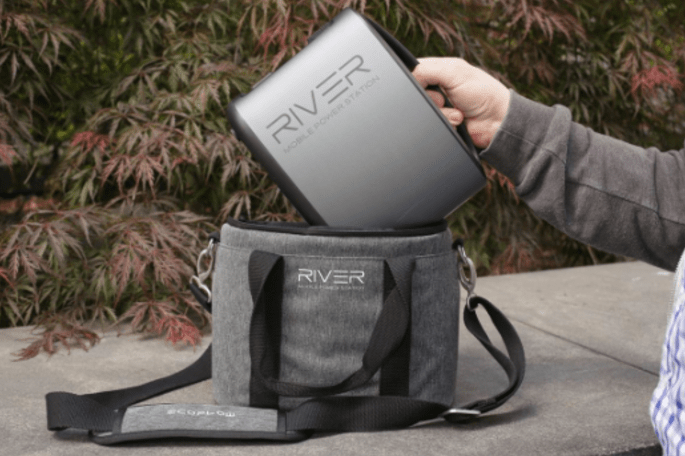 To compliment the large internal battery the RIVER has many charging capabilities. It has 11 charging ports and that can be used all at once. This includes 2 USB Quickcharge 2.0, 2 USB, 2 USB Type C, 2 AC Outlets, 2 DC Outlets, and a 12V Car Port. This large number of ports makes the RIVER an ideal solar generator for when your on the job or camping in the woods. The RIVER power bank also includes a bright LED display. This screen indicates the remaining battery capacity, the remaining charge time, the current power output of the battery, low temperature, high temperature, cooling fan on, AC overload, and port usage. To charge the RIVER are 3 different avenues. 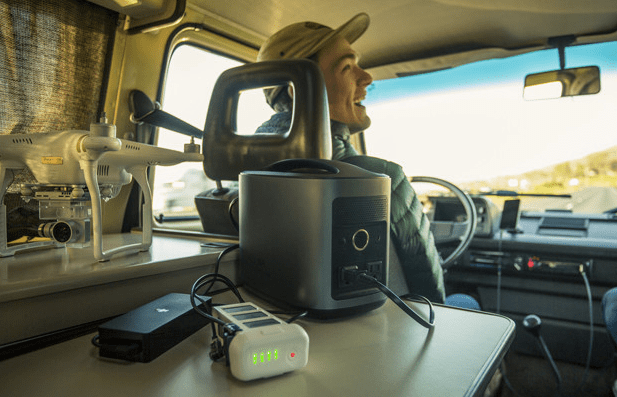 You can charge it with a wall socket (6 hrs), car jack (9 hrs), or with solar power (10-15 hrs). Together these different charging avenues allow you have energy no matter where you may be. Unfortunately, solar panels do not come with the battery itself. You must purchase a kit to get the solar panels. EcoFlow also offers 2 different solar panels. You can buy a 50W or 21W foldable solar panel. The 50W solar panel is recommended if you want to get the quickest solar charging times possible. One of the best aspects of this device is the materials that it uses. Both the solar panel and lithium-ion battery are made with quality materials. The battery itself holds a charge for up to one year and to has at least 500 cycles. The solar panel is highly efficient and can covert a lot of energy. In addition the outer-casing of the battery is “element-proof” and water-resistant. Meaning you can take it out in nature without having to worry about damaging it. Dust and small amounts of water shouldn’t harm the device. EcoFlow Tech also gives you the option of buying a carrying case for the battery. This stylish case is allows you to effortlessly transport the device while keeping it protected. Unfortunately, the solar panels cannot fit in the case, but they are foldable so transporting them is easy too. Overall the RIVER mobile power station and solar generator is a great product. We truly like how many different charging options you get with this device. These charging ports give you full potential for the large battery and ultimately keep all your devices charged. 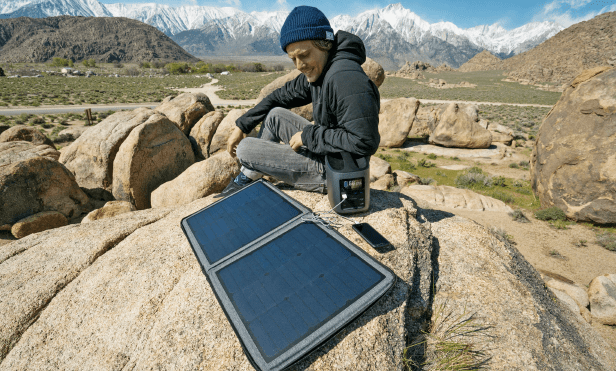 We think the RIVER solar generator is perfect for anyone who needs a small portable generator that doesn’t produce any sound or pollution. It can be used on a job site, while filming, or while camping. EcoFlow Tech is currently holding an Indiegogo campaign to support this product. They are offering a great discount for these orders and will discontinue this discount once the campaign in over. We recommend checking out their campaign and supporting it before the discount expires!